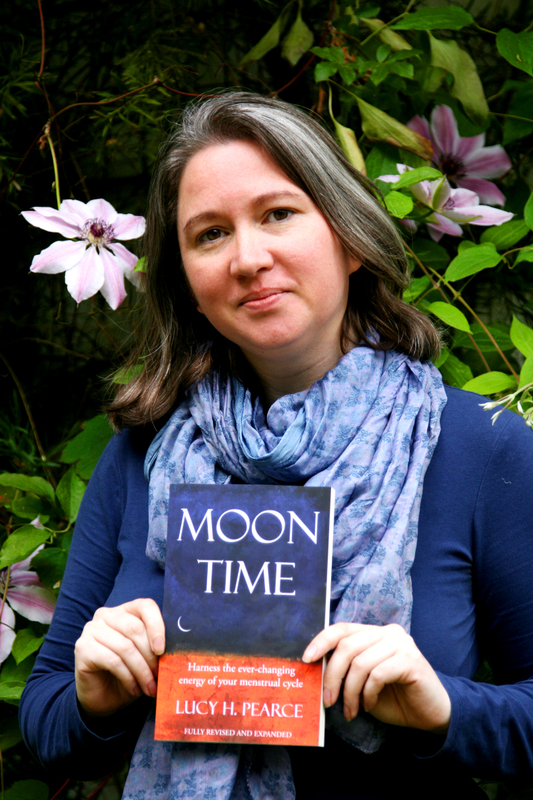 The second edition of my book, Moon Time, has LANDED! And until Saturday, there is a FABULOUS LAUNCH BONUS… read on for details… and grab it whilst you can. Guidance on living and working in sync with your cycle. Natural approaches to healing PMS. Self-care practices to nurture and support. How the moon impacts our cycles. How to celebrate a girl’s first period. Originally self-published back in 2012, Moon Time was my first book. It has been recommended woman to woman, being hailed as ‘life-changing’ by readers around the world, consistently placing it #1 in Menstruation on Amazon.com. We are thrilled to be bringing it into the growing Womancraft Publishing catalogue at last. Join the mailing list and get a FREE SAMPLE of Moon Time plus 10% off signed copies. Get it now from Amazon.com, Amazon.co.uk or a signed copy from the Womancraft Publishing store. Healing modalities for the womb. More on the red, white and wise woman cycles. A hugely expanded and fully-updated resource section. In revising it I actually doubled it in size… but then thought some of that new content would be better off in a new book… so I took it out… but the new book has taken on a life of its own in quite a different direction… So long story short… for one day only… I’m giving it away! You can get your hands on my favourite missing chapter: Welcome to your Womb… plus access to a live group call with me next week. But hurry! To qualify you need to buy a paperback or ebook copy on FRIDAY JUNE 5! 1. 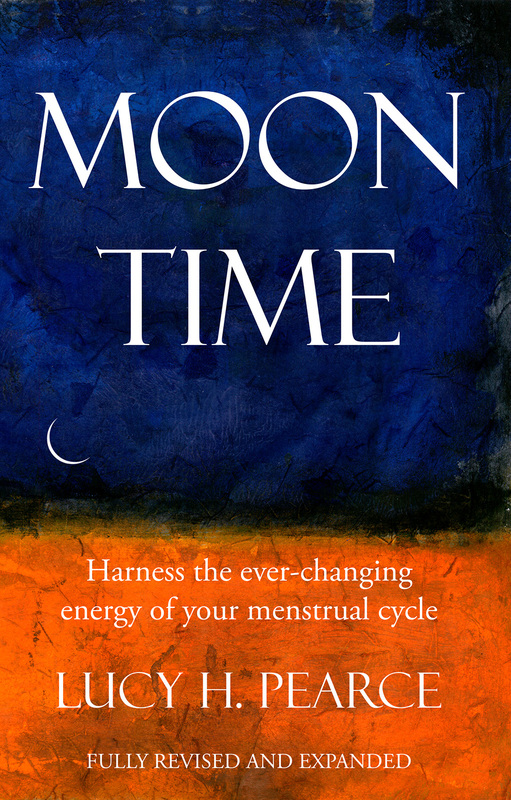 Buy a copy of Moon Time: harness the ever-changing energy of your menstrual cycle on launch day FRIDAY June 5 2015. (Paperback or ebook format – it doesn’t matter which.) Get it now from Amazon.com, Amazon.co.uk or a signed copy from the Womancraft Publishing store. 2. Simply fill in your name, email address and your Amazon order code, or order number from the Womancraft store on this handy form. 3. We’ll look after the rest! You will receive a bonus e-chapter this weekend of the book plus an invite to a video call with me: Living in Flow – harnessing the power of your menstrual cycle will take place on Wednesday June 10 2015 at 8pm GMT. PRAISE FOR MOON TIMELucy your book is monumental. The wisdom in Moon Time sets a new course where we glimpse a future culture reshaped by honoring our womanhood journeys one woman at a time. ALisa Starkweather, author and founder of the Red Tent Temple movement. A beautiful, inspiring book full of practical information and ideas. Lucy not only guides us through the wisdom inherent in our wombs, our cycles and our hearts, but also encourages us to share, express, celebrate and enjoy what it means to be female. I have become acquainted with every single one of these women via my book – I honour their support and am deeply grateful for their willingness to stand shoulder to shoulder with me and share my work with their people. There are sisters here from Ireland, UK, US, France and Australia. Do take a moment to visit their wonderful businesses, and check out their fab books and programs. Holly Grigg-Spall & Dana Michelle Gillespie co-created #RockYourRhythm awareness campaign. www.rockyourrhythm.com Find out more about their charting app from http://www.mymoontime.com which was in part inspired by Moon Time. Molly Remer is a priestess, writer, teacher, and artist. Author of Womanrunes: A guide to their use and interpretation, she blogs at Talk Birth (http://talkbirth.me) and (http://goddesspriestess.com). 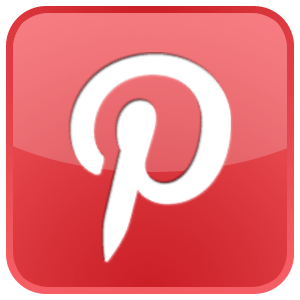 Jane Bennett – teacher and co-author of The Pill: Are you sure it’s for you? 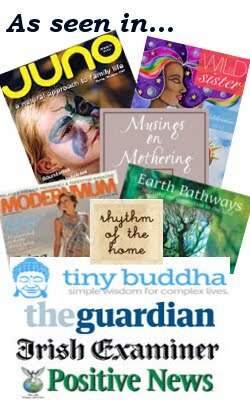 Miranda Gray, founder Womb Blessings, author Red Moon and The Optimised Woman. This entry was posted in Books, Healing, Menarche, Menopause, Menstruation, Moon Time, Perimenopause, Periods, PMS, Red tents, Rites of Passage, Wise Women, Woman-craft, Women's Circles and tagged menarche, menstrual cycle, menstruation, moon time, moontime, periods on June 4, 2015 by Lucy H. Pearce. This is a guestpost by Barbara Hanneloré, founder of Women’s Way Moon Cycles. Recently I was asked why I referred to the menstrual time of the month as being “receptive,” when it is, physically, a release of a flow outward. The woman said she would not think of that time as being receptive, and of course I could understand her point. Why is menstruation considered a “receptive” time? A receptive time of month is when we are more sensitive to impressions and more inwardly focused, which is what happens around the time of menstruation for most women. This is an energetic quality, more than a physical one. Menstruation is our “inner time,” energetically, when we turn toward ourselves and focus on our own feelings and needs. This offers us a necessary and healing balance to all those other times of the month when we are most likely to be extending ourselves outward and focusing on other people! When we think of our cycle as having “phases” throughout the month, like the moon or seasons, we can begin to appreciate these different qualities, and use them to our advantage. Generally, the time around ovulation is considered to be a “radiant” time of the month for a woman, like full moon or summer; our energy expands outward into social activity, projects and conversations. We are fully engaged with our community. The balance to this outer focus is that the “light” then wanes as menstruation approaches – we enter a different phase, just as the moonlight and sunlight wane at certain times. Our quality becomes one of Being, more than Doing; we sit within ourselves, like dark moon or winter; our energy is drawing inward. We are letting go of what no longer serves us, physically and on other levels as well. As we release the old, we absorb the beginnings of the new. Boundaries are more fluid at this time, and that means two we want to be open to new guidance and inspiration,while guarding ourselves from disturbing or exhausting input that has no value for us. This is the time to step back and take a break – to gain wisdom by evaluating and making sense of the month that has just gone by. To receive guidance for the coming month. To absorb the subtle messages we may need in order to stay healthy and inspired. So – try to create a space for some “time out,” and guard this time as you would any other important appointment – free from unnecessary interruptions and disturbing images or drama. Take a break from the media! Save complex activities for a later time! Don’t engage in conversations that don’t feel good. You can do it! This will be different for each woman, of course, but these personal “seasons” can become predictable, and used to your advantage. Not only for productivity, but for fulfillment as well…and when you’re happy, others are happy too! Once you begin with small steps, more ideas will occur to you, and you will begin to transform your month into one that serves you, as it was meant to. Barbara Hann eloré is founder of Women’s Way Moon Cycles, a creative program that embraces the natural beauty of women’s cycles in a holistic and healing way. She has helped women re-discover the power of their inner rhythms through the gifts of Nature, Sacred Space and the Healing Arts for over 20 years. She is author of the award-winning book, The Moon and You: a Woman’s Guide to an Easier Monthly Cycle, and host of the virtual workshop, Welcome Your Rhythm. 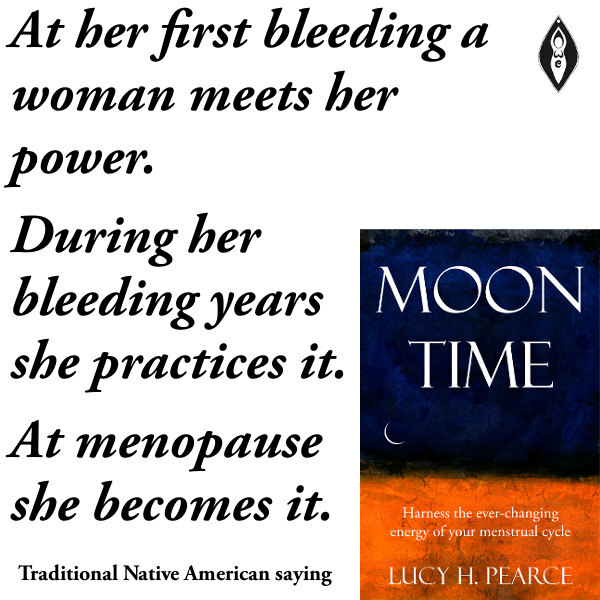 This entry was posted in Empowerment, Guestposts, Menstruation, Moon Time, PMS on June 30, 2014 by Lucy H. Pearce. Have you come across womb wraps? I hadn’t… until only two weeks ago. either during menstruation, pregnancy or postpartum, then you will know how you long for comfort and support… but that it’s hard to find. When Claire Taylor of www.cherishingwoman.org contacted me to tell me about her womb wraps, I was so excited to hear that there was even such a thing, having struggled with all of the above problems over the years. Womb wraps sounded so comforting, I just had to see one for myself. Having been sick for weeks, with monster PMS and chronic lower back pain, I needed some comfort and love… and fast. It arrived in a flash. Ripped open by my daughters who demanded to know what it was. I didn’t lose a second in trying it on – the details that come with it are super clear. It is like a mini wrap skirt of softest fleece, with long ties. It reminded me a little of wearing a wrap sling – only much simpler and lower on the body – but it is the same feeling of being hugged. My daughters and son immediately started stroking it, whilst asking what it was for, saying that they could stroke it forever it was so soft. They each demanded a try (my daughter instinctively slinging her doll in it!). It is soothing and warming like this and gives gentle support to the whole belly, womb, kidney and pelvis area. You could wear one round the house or out and about without anyone looking twice- they come in maroon, chocolate and leopard print. But that’s only half the magic! 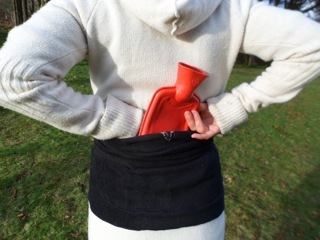 We then we heated up a hot water bottle and popped it into the integrated pouch at the back – worn one way the heat is held over the lower back, the other way and it’s over the womb. We had to readjust the tension a bit to support the weight of the water bottle. Holy mama, it was divine. So, so soothing. Pure heaven. Soft, stretchy, warming – like having a perfect hug around your belly and lower back. These fleecy wraps are so nurturing. Beautifully made by hand, you can tel they’ve been stitched with love – as there’s even a little heart stitched into the back. As you know I love supporting women in business, especially women creating and selling products to support and empower other women. These tick every box for me.They get my absolute seal of approval for a well-designed and -made product especially for women – for happy wombs everywhere – they should become part of every woman’s self-care kit. 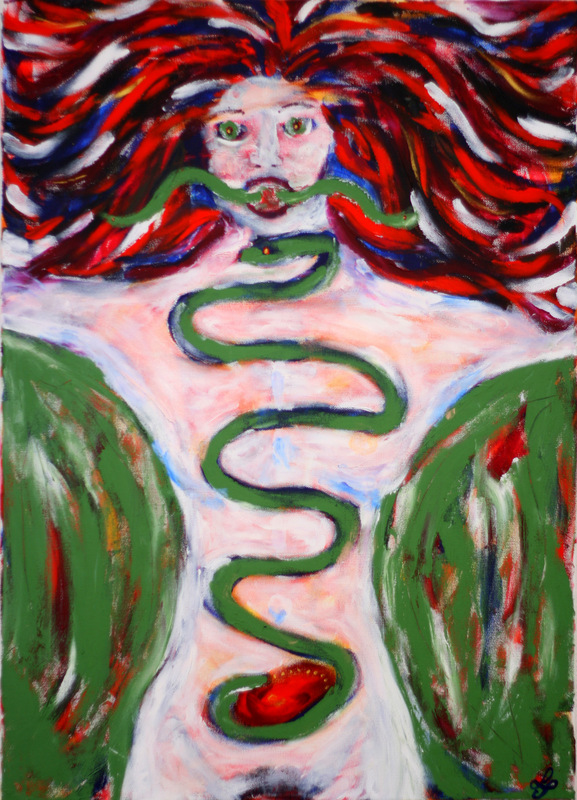 This entry was posted in Healing, Mamahood, Menstruation, Periods, PMS, Post Partum, Self-Care on April 1, 2014 by Lucy H. Pearce. 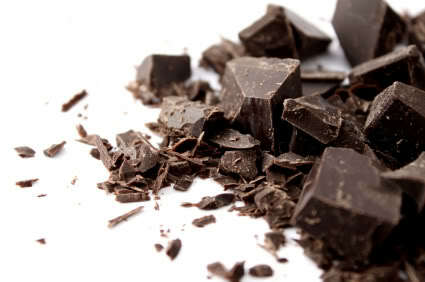 Chocolate is the number-one craved food among women. And at a certain time of the month, the need for chocolate becomes as strong as our need for extra sleep. We women are wired for it it seems. Though the jury is out on whether this is actually “true”- as some say that it is just our cravings for extra sugar and caffeine to get us through the hormonal slump, and so is best avoided. The Aztecs who first discovered it considered it a sacred ceremonial food, and most women today have similar reverence for it. I love the artist and teacher Shiloh Sophia’s sensual approach. She considers chocolate sacred soul medicine to help us to contact our muse of creativity and sensuality. Before she starts painting she puts on her big hat and flowing coat, pours herself a cup of steaming herbal tea, or a glass of tequila, and has a square of rich, dark chocolate to get her juices flowing. She’s my kinda woman! I have to weigh up the risks, as on the one hand my chocolate needs are high in the pre-menstrual phases – but so is my susceptibility to migraines, which are often triggered by chocolate. … but it was then totally contradicted by the next book I read Potatoes Not Prozac which is all about sugar, addiction and its role in mood disorders, weight issues and depression which tells us we need to steer well clear! But what I took from that is the importance of being aware of sugar sensitivity, and cutting it out as much as possible. I’m also cutting out wheat for that reason. And that chocolate is sacred women’s food which provides what our bodies crave and yearn for. PMS time is here now, and I wanted a snack to nourish me through my wheat and sugar free time. So check out my PMS no-bake bars over on my baking blog today for the recipe that I cooked up last night (and has been given the seal of approval by everyone who’s tried it!) It requires no chopping or baking, and minimal work, and can be made a few days head when you are still on high post-ovulatory energy. It has no added sugar, but is nutrient rich with nuts, seeds and oats, giving you the nutritional boost you need premenstrually, without the sugar rush. And most importantly a rich, dark, deep hit of chocolate. Whip up a batch, take some private red tent time, and nurture and nourish yourself, dear love. This entry was posted in Menstruation, Nutrition, PMS on September 11, 2013 by Lucy H. Pearce. This is a guest post contributed by Jess Dawson. As a mother I have realized how important it is to recognize the phases of the cycle, the moments when we feel like super mum, and the moments when we may struggle and find ourselves not wanting to be mums at all. After childbirth, many women can experience changes in their menstrual cycle: it is common for women to experience emotional turbulence pre-menstrually, and for physical pain to become worse around ovulation. These changes can be due to a number of factors, most commonly a change in hormones, lack of sleep, irregular eating, increased intake of caffeine and sugar loaded foods, and the pressures of parenthood. Insomnia, depression, lethargy, boredom, anger and at times a profound need to erase one’s situation are some of the emotions mothers may experience pre-menstrually. During this phase many women mention feeling more irritable, more likely to snap at their children, and of feeling overwhelmed by parental responsibility. If these feelings are misunderstood and not acknowledged it is easy for the mother to act in a way that can be detrimental to the flow of the home, shouting, crying retreating and being irrational. Children whose mothers suffer during their pre-menstrual phase can present with lower immune systems, shifts in behavior, tantrums, being more stubborn and emotionally shut down. As a result the mother can begin to feel a failure and can become isolated within the home. By charting our cycles we begin to recognise our highs and lows, when we are supersonic indestructible mother and when we are walking around like a fragile piece of porcelain about to break and when we feel a desperate need to be quiet and alone or when the act of communicating is quite beyond us. We begin to see that all these qualities are a vital part of our inner makeup and offer us deeper insight into ourselves. However, I believe that with good awareness and planning we can be true to our capabilities at any given time in the cycle and as a consequence reduce stress within our life and consequently lower our struggles during our pre-menstrual phase. Cycle awareness is about acceptance, finding the strength to work with ourselves rather than against ourselves. The beauty of charting your cycle is the recognition of your cyclical pattern of growth, renewal, and rest. Even women who do not have regular periods will find there is still a rhythm and pattern to their cycle. Avoid caffeine and alcohol during your pre-menstrual phase and your bleeding. Learn to say NO when you know you need to be quiet. Plan ahead around your pre- menstrual phase, if you are regular mark it on the calendar. Tell you partner what is going on. Don’t expect them to know. Eat a good healthy diet. If necessary go and speak to your doctor. This entry was posted in Menstruation, Moon Time, Motherhood, Periods, PMS and tagged healing PMS, healing PMT, moon time, motherhood and menstruation, periods, PMS, PMT, premenstrual tension, Women's Quest on May 28, 2013 by Lucy H. Pearce.